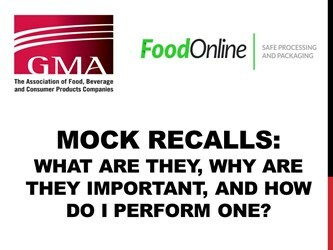 Earlier this month, the Grocery Manufacturers Association (GMA) partnered with Food Online for a live web chat, Mock Recalls: What Are They, Why Are They Important, And How Do I Perform One? 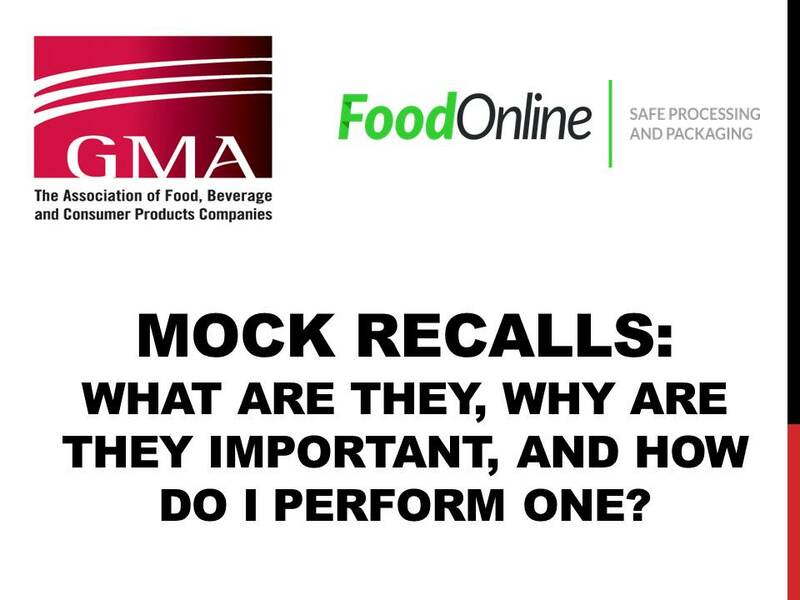 In this 45-minute live Q&A, Jennifer McEntire, Ph.D., Vice President of Science Operations at GMA, presented on the mock recalls and best practices for performing them. She also answered the live audience’s questions on topic. Sam Lewis, Editor, Food Online: Hello, everyone, and thank you for attending today’s web chat. My name is Sam Lewis. I’m the editor of Food Online. I’ll be your moderator for today’s topic: Mock Recalls — What They Are, Why They’re Important, and How Do I Perform One? I’d like to thank the Grocery Manufacturers Association (GMA) for partnering with Food Online and presenting on this important and timely topic. And thank you, attendees for joining us. We’re expecting today’s presentation to take approximately 45 minutes. Most of that time will be dedicated to answering your direct questions. Feel free to submit your questions at any time during our session. It’s my pleasure to introduce to you our subject matter expert, Dr. Jennifer McEntire. She’s the Vice President of Science Operations at GMA. Dr. McEntire, welcome. Please tell us a little bit about GMA, yourself, as well as the importance of today’s topic. Jennifer McEntire, Ph.D., Vice President of Science Operations, the Grocery Manufacturers Association: Thanks a lot, Sam. I appreciate being on for this inaugural web chat with Food Online. GMA is a trade association. It’s the trade association representing the world’s leading food, beverage, and consumer product companies and associated partners. We were founded in 1908 and we have a primary focus on product safety, science-based public policies and industry initiatives to empower people with the tools and information they need to make informed choices and we help your lives. You can reach out to me or anyone else here at GMA to learn a little bit more about our organization and what we do. Today, we’ll be talking about mock recalls, something that I’ve worked with our members on, as well as in my previous experience as a consultant worked with clients on. I’ve also worked with real recalls, and we won’t touch on that as much today. But, given the number of recalls that occur, hundreds of recalls every year, I’ve always told people that for companies, it’s not a question of if, it’s a question of when. So, it’s critically important that people be prepared in mock recalls and certainly one way to start the preparation process. Sam: Sounds like there is some real responsibility involved in this exercise. So, without any further ado, let’s talk about today’s agenda. Our goal is to provide you with best practices that you should employ when planning and executing a mock recall. We’ll define what a mock recall is, distinguish it from traceability exercises, and explain the importance of mock recalls. We will explain who should be on your company’s recall team and define the roles and duties of each recall team member. We will also clarify what the FDA expects in a recall and explain how FSMA is affecting recall plans and mock recalls. Our last, but most important, item on today’s agenda is answering your questions. So let’s get started. Dr. McEntire, what is a mock recall? How is it different from a trace back or trace forward exercise? And why are mock recalls important? Dr. McEntire: Sure. So, mock recalls come in all shapes and sizes, and really, the ultimately goal is to test your recall plan. So, most companies should have a recall plan. They too come in all shapes and sizes. The important thing is that all affected members of your recall team understand what’s in that recall plan, understand how it works. You can put a plan down on paper, but until you actually need to implement that plan, you don’t know if it’s going to work well. So, mock recalls provide that perfect opportunity to practice, and practice makes perfect. I do recommend that mock recalls be conducted that address a wide variety of topics and a wide variety of scenarios that are true to life. Although every recall is different and unanticipated, you can think through the types of scenarios that you may encounter, that may put you in a potential recall situation, and start to construct those scenarios in a way that allows you to test that recall plan and answer questions. These questions include who knows about this issue first, what’s that chain of command, who makes the final decision, are we going to recall or are we not, how are those decisions made, how are those decisions documented, and how are those decisions and other information communicated? Whether that’s communicating it to regulators, who’s in charge of doing what, and what do you want to say when on the PR side, how are you communicating with consumers, your own supply chain, your customers? There are also financial considerations. So, I’ve done a lot of work in the area of traceability and I fear that sometimes people do confuse a trace back exercise with a mock recall. They are not one and the same. So a mock recall should be much more robust, much more multifaceted. The traceability, I don’t want to say simply, but relative to a mock recall, it is simply tracing the flow and path of that product, knowing where the product went, and where it came from. As we’ll discuss, a mock recall is a bit more than that, quite a bit more, but again, gives you that opportunity to make sure that if you are faced with an actual recall situation, that you can perform adequately. Sam: There seems to be a lot involved, probably more than most people realize. So we’re going to advance to the next slide and this slide will show you a flowchart of what a mock recall would look like. So, Dr. McEntire, could you take us through the slide and explain to our audience what exactly is happening? Dr. McEntire: Absolutely. As I said, in real life if there was a real potential for a recall, you don’t know what’s going to hit you. So, the first, at the top level, is the identification of what is that issue. Then you need to get a group of people together, and we’ll talk about that in just a minute, who evaluate the decision. So, who are the people you need in the room to be discussing this issue and then how are you going to evaluate it? How do you make that decision that “yes, we’re going to move forward with the recall,” or “no, we’re not and here’s why.” If you do decide that yes, you think you’re going to recall this product — again whether it’s in real life or in a mock recall scenario — understanding what is the scope of the issue. Do I know when the issue started? Do I know when the issue ended? So, that I know I can kind of bracket that affected product? What am I going to tell people to do with that product? Which depends on why you’re recalling it. Sam: There is definitely a lot to think about. With that, there are also many moving parts, which includes your recall team. Dr. McEntire, who should be on your company’s recall team? What are the responsibilities of each recall team member? Dr. McEntire: Companies have different positions. Some bigger companies may have corporate responsibilities and facility responsibilities. Some smaller companies may have one individual who wears many of these hats. You need to think about the structure that you have, staff that you have, and how do you identify people who would comprise this recall team. But, generally speaking, you do need a recall coordinator. That’s the person who is well, they’re the coordinator. They must be able to focus on the recall. So, during the course of this issue or during the course of the mock recall, they are the person that needs to be dedicating 100 and maybe more than 100 percent of their time to this issue. There are many other people who should be members of this recall team. So, you may want someone from operations. You probably want someone from the communication side — PR; sales and marketing, when we think about how you’re communicating with customers and consumers; logistics and receiving looking at some of those traceability issues; quality assurance looking up why did we recall this product and do we know what the problem was and have we defined it well. On the accounting side, and some of the financial aspects, you may want a scientific advisor, an external scientific advisor. You may have in-house counsel. You may want to get external counsel, an outside attorney. Then a straight-up support because there is going to be a lot going on. The mock recall should, again, mimic a real recall scenario as closely as possible. So, you want a documentation of all the actions that are taking, you want the follow-up to be documented, so having that administrative support as well is important. Some companies sometimes choose to have a subset, a smaller group of individuals who are kind of a core recall team who are in charge of some of the decision-making and then after the point that the decision is made, then that recall team expands based on the roles and responsibilities associated with a particular recall scenario. The same thing can occur again in that mock recall scenario to test that process and those processes. Sam: The more you speak, the more I’m just enamored by the amount of moving pieces that a recall and even the mock exercise has. You need to choose the right people for your recall team. Moving on to the next topic, how does the FDA play into this? How does FSMA fit into this? What are the FDA expectations of a food company’s recall plan? How is FSMA affecting mock recalls and those recall plans? Dr. McEntire: That’s a good question because the Food Safety Modernization Act (FSMA), although it was signed into law over five years ago now, the Preventive Controls Rule which is one of the big ones, it’s been polished, it’s been finalized, and bigger companies will need to start to comply mid-September 2016. One of the elements, one of the requirements in the Preventive Controls Rule, is that companies have a recall plan. As you look at the FDA requirements for a recall plan, they’re kind of bare bones and pretty much common sense. The “who’s going to do what,” “how are you going to advise about product disposition.” There are really only a couple of elements that are core and critical to that recall plan. In terms of mock recalls and the requirements to conduct mock recalls, there is none from a regulatory standpoint. Now, I know that several of the audit schemes do have their own requirements to conduct mock recalls on whatever type of basis — an annual basis or twice a year or whatever. Additionally, companies may choose to have their own requirements that are way above and beyond the regulatory requirements. As a baseline, you do need a recall plan that identifies, really, just core information. But, there is no regulatory requirement to conduct a mock recall. An inspector is not going to come in to your facility and ask to see the results of your mock recall. Sam: There’s certainly a lot to think about. We appreciate that, Dr. McEntire. It was very informative. I think it is time we move on to the meat and potatoes, sorry for the pun, of our web chat; and that is to answer your questions directly. In Part Two of this series, Dr. McEntire will answer questions from the web chat’s live audience. Stay tuned.